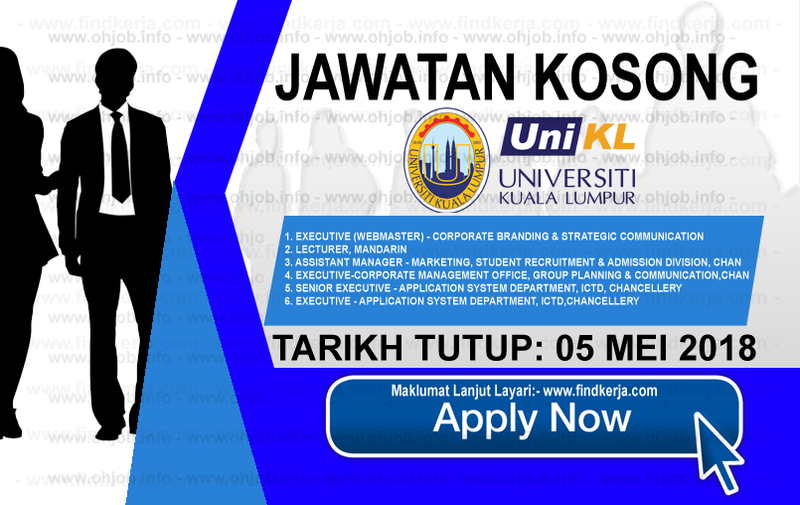 Universiti Kuala Lumpur (UniKL) is a leading university in engineering technology established on 20 August 2002. Wholly owned by Majlis Amanah Rakyat (MARA), an agency under the Ministry of Rural and Regional Development (KKLW), Malaysia, the university is given the mandate to upgrade the status of technical education in Malaysia by the government. Terima Kasih Kerana Membaca Dan Menyemak Kerja Kosong UniKL - Universiti Kuala Lumpur (05 Mei 2018) Selamat Memohon Dan Semoga Berjaya Kami Ucapkan, Sila LIKE Facebook Page Kami Dan Kongsikan Kepada Semua.